If you follow me on Twitter, you know how much I like Veronique Gens…have been hooked since her magnetic performance in Niobe Regina di Tebe at the Royal Opera and loved her debut lunchtime recital at Wigmore Hall in December. When I saw her return for an evening recital I had to have tickets and believe me it was a spectacular evening. 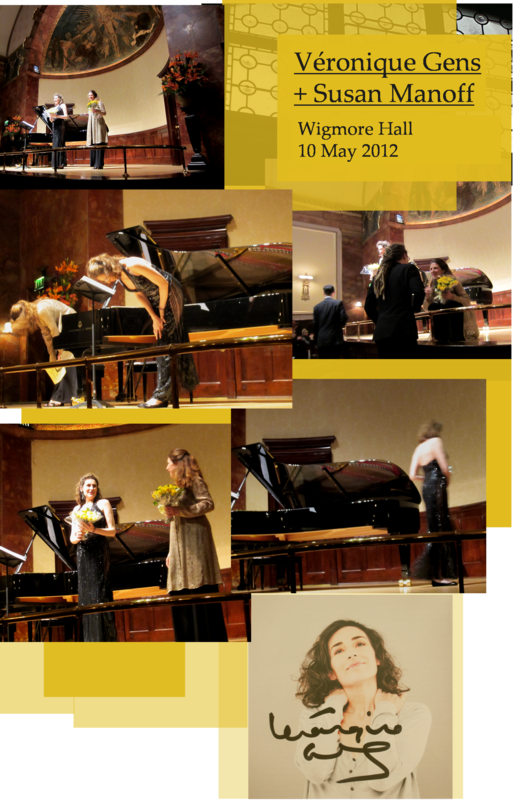 Seeing the Wigmore Hall sold out for her was an encouraging sign. She sang a beautiful selection of songs by Fauré, Duparc, Debussy, Chausson and Hahn. Some of them I had listened to recently by Marina Rebeka and Ailyn Pérez, both of them truly wonderful singers, but with the unbeatable accompaniment of Susan Manoff’s playing and the exquisite Gens the songs take a new life. The two of them worked through the evening as a great team, bouncing off each other and also allowing enough space for individual expression and actually having fun. Manoff played her part as an equal and made a huge impression. 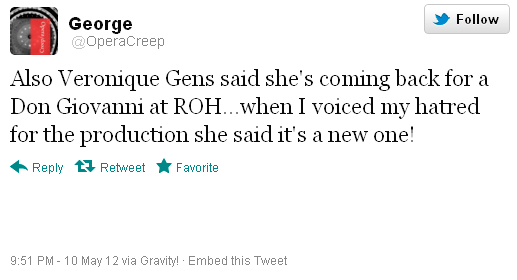 But I will not tire you with harping on how extraordinary a singer Gens is. But it has to be said that every word matters and the very way she expresses the feeling of every song is just amazing to watch. In turn she will be mindless and frivolous and the next moment taken over by melancholy and in a state of reverie. She has a unique gift to not only sing gloriously but to also express the music through her body and the reflection of each mood with simple flicks and fluttering of her fingers and her intense stare. She was acting through the whole recital with those magical final notes held and feeling her body letting go the character between songs and release her focus and breath. She is as far removed from cheap histrionics and typical singing diva ticks imaginable. Her whole behaviour on stage is demure (despite the change to a rather revealing gown for the second half of the recital), confident and winning. Judging from the reaction of the crowd (some of the loudest applause I’ve ever heard at the venue) she captivated the audience. They were both gracious enough to offer us three encores (Gounod, Poulenc and Fauré) which were truly amazing and even had the stamina for a meet and greet afterwards. I stumbled in front of them and told them how exquisite they were…but one can really say very little in front of such total majestic command of repertoire and form. If she is singing mélodies anywhere near to where you happen to be, you owe it to yourselves to see them both live. It was an intoxicatingly French evening to remember.